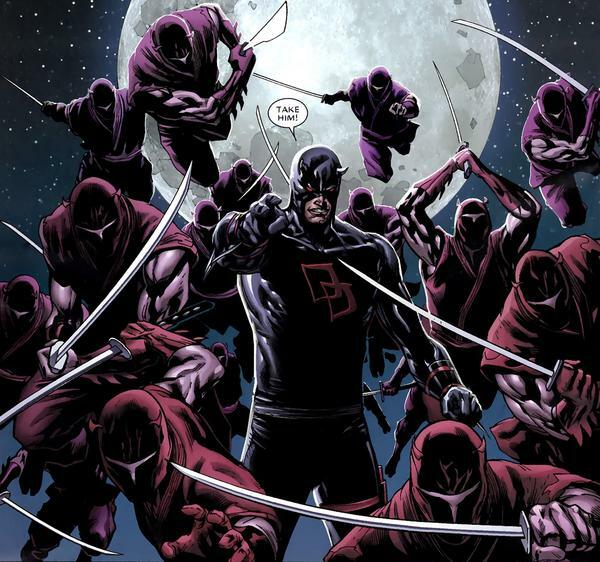 The remaining members of the Snakeroot clan which corrupted the hand conspire to finally push Daredevil the new leader of the hand over the edge. On a transport to the raft Bullseye tricks the guards into releasing him by stopping his heart beat. He kills them and takes over the plane. He drops in on Hells Kitchen to have fun with Daredevil. The avengers meet up and Luke Cage voices his belief that Daredevil has gone off the deep end. 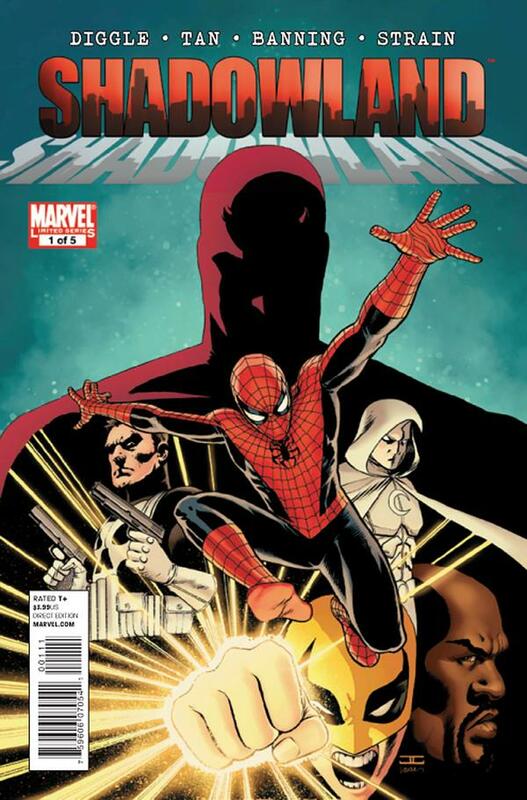 The rest of the team is willing to give him the benefit of the doubt granted this “Shadowland” situation is temporary. Bullseye storms the walls of Shadowland and calls out Daredevil. DD send his ninja after him vowing an end to Bullseye’s murderous reign. Luke and Danny try to help but when they refuse to swear loyalty to the hand they are prevented from helping. Bulleye leads the ninja away and kills them but finds himself helpless against the ferocity of DD. He gets both arms dislocated before being impaled on a sai. 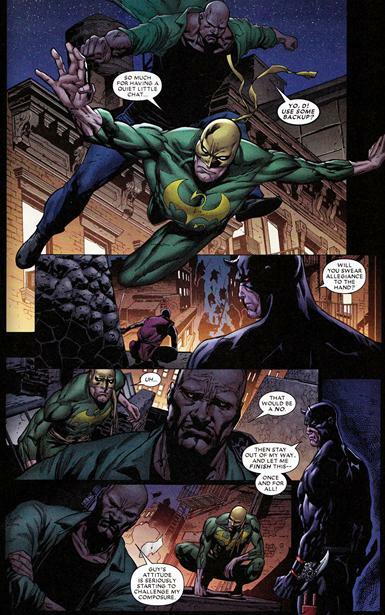 Luke cage and Iron Fist witness the killing and both are shocked. Bullseye gets killed, great villain but he deserved to die. Seeing Daredevil run him through the same way Bullseye did to his former love Elektra was worth everything that will happen next. Art had a dark somber tone which suited the story. Luke cage in this issue strange enough was the voice of reason, he realized long before his superhero brethren that DD would and was falling into darkness. It was a nice twists to see Luke being this perceptive especially in light of leading the new avengers and the thunderbolts. His character sure has come a long way. The cover art- for the main/flagship title of a major event the cover was very lackluster especially when compared to the covers of Shadowland-Blood on the streets and Shadowland- Powerman both of which had great covers! The interior art was very grainy, maybe it was the issue I had but it had a very unpolished look, again the visuals in the side books where much much better. For the ‘flagship title’ this was a disappointment. The story of how Bullseye escaped was contrived…..C’mon this is a mass murderer! who in their right mind would panic and try to resuscitate him if he went into cardiac arrest? WHO?! That was just plain ridiculous! The story here also didn’t much warrant it’s own issue it was mostly filler with just a reason to have DD and Bullseye fight. The fight itself was anticlimactic considering their history.